We had been out shopping… & shopping always makes you hungry.. doesn’t it?? Lol me being the multiple small meals per day person needs to eat every couple of hours.. so I had to eat…!!! we found a nice restaurant in the mall.. K loves barbecued food.. specially the sticky barbecue sauce… we went through the menu, the restaurant was a part of one of the American food chains.. they had some buffalo wings, we ended up ordering a plate of those chicken wings to start our lunch with… they were both spicy and sweet.. K loved them and I liked it a lot as well. On the way back home I kept thinking why should it be difficult to re-create it at home… it sure should be easy… hence I thought of trying them out at home… I thought about what the restaurant could have used to marinate them and I was sure there was some chilli sauce and honey in the marinade and to bring out the natural fat present in the chicken I thought of grilling them & avoided spraying them with oil before grilling them. Remove the skin from the chicken wings. There would be around 9-10 wings. I used medium sized wings. Wash the wings and drain out the water. Add the chili pepper sauce and honey and salt and crushed pepper and mix well. Keep the marinated chicken for atleast 3-4 hours if you want to prepare it on the same day. Else put it in the freezer and let them marinate well for a day or two. Pre-heat the oven to 200 degrees in the grill mode. 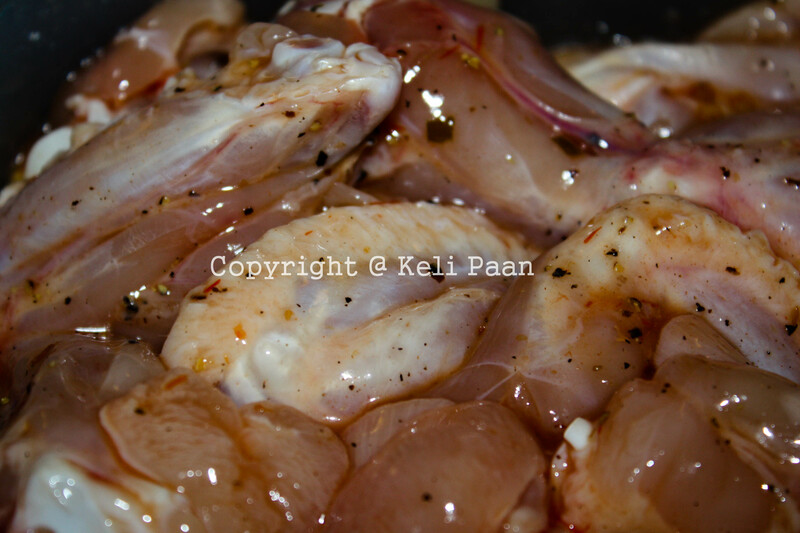 Defreeze the chicken wings for atleast for an hour or two if the wings were frozen after marination. Place the chicken wings on the grill and grill them for a total of 20 minutes. Midway just turn them around for uniform grilling. Serve hot with the dip of your choice. We enjoyed them with some Chinese Sweet chilli dip. If you liked this recipe, you may also like – Turmeric/Haldi chicken fry…, Mustard & Peri Peri flavoured grilled chicken.., Sweet n Spicy Spinach Chicken – Chinese style, Pepper chicken in cream and basil with roast potatoes, Chicken Fry etc.